Monaco means Mediterranean beaches, high-end casinos, no income tax….and of course, the Grand Prix. A Grand Prix driver’s coordination and manual dexterity is reflected in the manufacture and appearance of Tag Heuer’s Monaco Grand Prix watch. 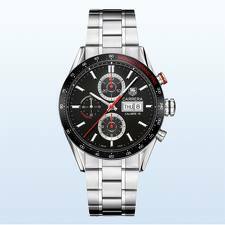 This watch melds Tag Heuer’s iconic Carrera line with the sportier and somewhat more dashing Monaco line. The black aluminum bezel is printed with legend “Monaco Grand Prix” in red and the Monaco Grand Prix logo and a “Limited Edition” number appear on the back of the watch’s casing. Its polished steel case and strap are easy to care for and look both slick and stylish. The black aluminum dial is set off by red chronography hands, hand-applied indexes, and numerals at four cardinal points: 3, 6, 9, and 12. Pros: This watch boasts rapid date correction, a power reserve of 42 hours, water-resistance, its own Limited Edition number, and a tachymeter on the bezel. The tachymeter should be especially appealing to fans of the Grand Prix—or racing fans of any kind—because of its accuracy in using time and distance to measure speed. Cons: Automatic movement has its drawbacks as well as its advantages. Although an automatic movement means that a watch’s hands move very smoothly, gliding from one index to the next, consumers find that sometimes the smoothness of that movement detracts from the timepiece’s overall accuracy. While precise workmanship is a beauty to behold, that precision may not translate to real-world time keeping. Believe it or not, there are also cons associated with a sapphire crystal. While the sapphire crystal is more scratch resistant than its cheaper acrylic counterpart, it can smash more easily because it’s a bit less flexible. Further, Tag Heuer’s website is very upfront about the issue of water resistance. Unlike other watch manufacturers, Tag Heuer makes it clear to consumers that water resistance is not necessarily a “permanent condition” of any watch. Water resistance is largely determined by the integrity of rubber seals that will eventually wear down. This is why Tag Heuer recommends that consumers take their watches to an approved service center annually to be tested for water resistance. But does this factor make the watch less worthy of purchase? I’d say no. Just because Tag Heuer is more forthcoming about its water-resistance factor doesn’t mean that it’s any less water-resistant than any other luxury watch.